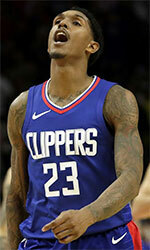 Tobias Harris (6'9''-F-92, college: Tennessee) had 22 points and 11 rebounds, Lou Williams (6'1''-SG-86) scored 17 off the bench, and the Los Angeles Clippers routed the visiting Washington Wizards 136-104 on Sunday night. Avery Bradley (6'2''-PG-90, college: Texas) chipped 15 points, and Montrezl Harrell (6'8''-F-94, college: Louisville) and Boban Marjanovic (7'4''-C-88, agency: BeoBasket) contributed 13 each for the Clippers, who had nine men in double figures and never trailed. Bradley Beal led the Wizards with 20 points, and John Wall had 18. The Clippers led by 15 at halftime and by 17 early in the third quarter before Beal capped a mini-Wizards run with a 3-pointer that got Washington within 81-71. Los Angeles responded with 16-0 run led by three 3-pointers from Patrick Beverly and five points from Danilo Gallinari. The Clippers led by 20 points after three quarters. Washington converted just 5 of 27 (18.5 percent) from 3-point range while the Clippers made 16 of 29 (55.2 percent). The Clippers have won four of their past five, while the Wizards fell to 1-3 on a five-game road trip that ends Tuesday at Memphis. Los Angeles was without forward Luc Mbah a Moute (sore left knee) while Washington center Dwight Howard (lower back soreness) has yet to play this season. Wizards forward Markieff Morris (6'10''-F-89, college: Kansas) left the game after taking an elbow to the face in the second quarter and did not return due to concussion symptoms. The game marked the return to Los Angeles of guard Austin Rivers (6'4''-G-92, college: Duke) - son of Clippers coach Doc Rivers - who was dealt to Washington on June 26 in exchange for center Marcin Gortat (7'0''-C-84). Rivers finished with nine points and three assists in 22 minutes. Gortat had four points and eight rebounds in 19 minutes. Shai Gilgeous-Alexander (6'6''-PG-98, college: Kentucky) swished a running half-court 3-pointer as the first quarter ended, and Harrell's layup capped a 17-4 run and gave the Clippers their largest lead of the first half, 42-24, with 9:24 left in the second quarter. The Clippers led 69-54 at intermission.